When you buy something on iTunes – whether it be music, movies, or books – it has certain protections which stop it from being shared with other people. To enable or disable that media from being played, you need to authorize or deauthorize a computer on iTunes. There are limitations to this however – you can only authorize up to five computers at a time, and the whole authorization/deauthorization process can only be done once a year. But this system also allows you to share your media content with family and close friends, provided they know your iTunes account details. The process is the same, whether you have a Windows PC or a Mac computer. Authorizing is not necessary for iOS devices, which are logged into your Apple ID. Sign into iTunes as usual with your Apple account. Then go to Account–>Authorisations–>Authorise This Computer. Choose that option. You will be asked to enter your Apple ID account name and password. It will then show the following. Now continue with your other devices, using the same process. You can also give your iTunes account details to a trusted family member or friend for them to also use the media files. But bear in mind, you are responsible for anything they buy on your account. Once you start using your iTunes account for quite some time, you will eventually use up all your authorizations, and not even realise it. So before trying to authorize again, you should check to see how many are being used. When you have reached your limit of five, you will then see a “Deauthorize All” button. So to find out the current status of your authorisations, click here. Alternatively, sign into iTunes, then choose Account–>View My Account. It leads to the same page. At the bottom of “Apple ID Summary“, you will see how many computers are currently authorized. The really bad thing about this is that it doesn’t list all of the authorized computers. If your maximum of five devices has been used up, and you are only using three devices, then the others may be devices you have sold or given away. In that instance, your only option is to deauthorize them all and start again. 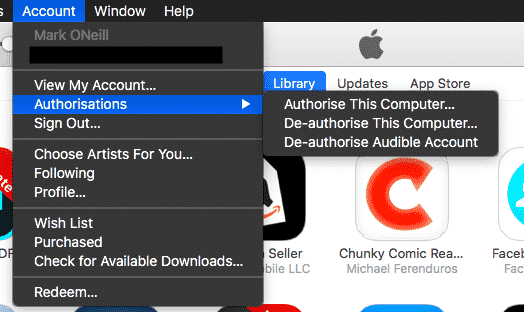 There are different scenarios for needing to deauthorize a computer from using your iTunes account. You are about to sell or give away a device. One of your devices has broken down and can no longer be used. You have split up with a spouse/boyfriend/girlfriend and you don’t want them to be able to use your account anymore. You suddenly don’t want your family or friends to see what you are downloading. To deauthorize a single device, you need to have actual physical access to that device and the iTunes app installed on it. If the device is broken or you don’t have access to the device, then you will need to use the “Deauthorize All” option and start again. At the time of writing this, there is no way to remotely deauthorize a single device. If you have physical access to the computer in question, open iTunes, and go to Account–>Authorisations–>De-Authorise This Computer. After confirming your Apple ID name and password, you will then be told the computer has been deauthorized. If it is the computer of an ex-spouse, ex-partner, or relative, they can obviously reauthorize if they know your account ID name and password. So after deauthorizing, it would probably be a good idea to change the account password. Or at the very least, switch on two-factor authentication. Technically Apple restricts authorizing and deauthorizing to once every twelve months. However, it has been noted in many places online that if you phone or email iTunes Customer Support, they will readily reset everything for you. That way, you can continue the whole authorization process more than once within a twelve month period. Authorizing and deauthorizing your devices is something you may find a pain in the neck. But ultimately it is designed to protect your media from being played by unauthorized people. Plus to be honest, Apple probably does it to try and make piracy harder. But it is an easy enough process, and once you have done it, you probably won’t have to do it again.